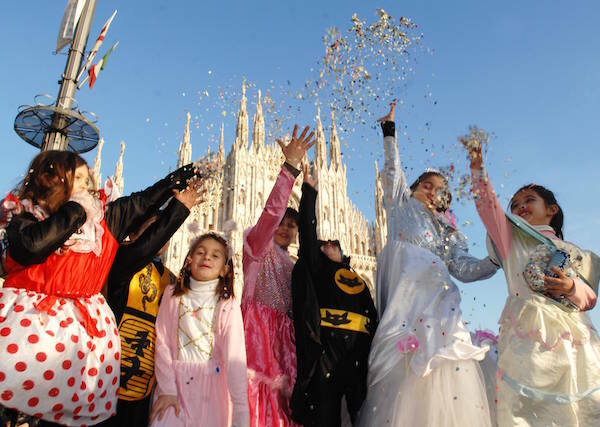 While Carnival celebrations in the Catholic world end with Ash Wednesday and the commencement of Lent, in Milan and its Lombardy province you will encounter Carnival crowds, confetti and the traditional Carnival parade on Fat Saturday, the Saturday following Ash Wednesday. Don’t be confused, as the Milanese aren’t either. They are following the Ambrosian or Milanese Rite, which sports differences in the liturgical year amongst others compared to its Roman counterpart. So if you feel like extending Carnival season for a couple of days this year, Milan and Lombardy are the places to go. The origins of the Ambrosian rite are difficult to trace. Today it is assumed, that Saint Ambrose, bishop of Milan in the 5th century (and the city’s patron saint), introduced his additions into the Liturgy of the Hours. Saint Ambrose is one of the 4 recognized doctors or teachers of the Catholic church. He was one of its most influential figures in late Antiquity. Even though it has been tried to smoothen the differences between the Roman and the Ambrosian Rite, some differences remain. These are for example differences in the Mass (such as its own cycle of readings) and most notably in the Liturgical calendar: Advent has 6 weeks instead of 4 and Lent starts on Sunday after Ash Wednesday and Carnival continues until Fat Saturday or sabato grasso. Popular legend has it, that bishop Ambrose returned late from a religious pilgrimage and could not initiate Lent, which is why it started 4 days later. It might not seem important or a mere formal and traditional argument, however, there has been quite some power play involved. The Ambrosian Rite served as a source of assertiveness and differentiation towards Rome and Papal dominance. And still is a source of Milanese local patriotism today. The Ambrosian Rite is practiced in the Archdiocese of Milan, which includes almost all Lombardy Provinces and some more parishes in other provinces outside of Lombardy such as Novara and Ticino in Switzerland. The Carnival in Milan, that is Carnevale Ambrosiano, thus starts, when in other parts of Italy the party is already over (this season from February 9 to February 13, 2016). For example in Putignano (Apulia) Carnival float parades are scheduled until 9th February. The big street parade that takes part on Fat Saturday (starting in the morning) is lead by Meneghino, a playful servant, and his wife Cecca together with the city’s brass band. In Lombardy there is another famous mask: Harlequin, born in Bergamo. The parade in Milan follows the route Palestra, Piazza San Babila, Corso Europa, Piazza Fontana and Piazza Beccaria.